In 1997 the Italian choreographer Roberto Castello asked me and Giorgio Lazzarini (another composer from Lucca) to compose 32 sound pictures on the themes of the I CHING for his performance 64 VARIATIONS ON TIME (1st Part). Roberto wanted to create a series of short choreographies to be performed by three dancers in a box of 8m X 4m X 2,5m in a square of our city. The box was to be completely closed on all sides except for some holes settled in different positions through which the spectator could watch the performance like in a peep-show. Nobody of the audience would be told that the pieces were inspired by the I CHING. The particular length of every miniature (2 minutes) would mark the rhythm of the performance like a sort of musical clock. I composed a sequence of 14 pieces, which I called IL TEMPO CAMBIA, which means TIME CHANGES but also WEATHER CHANGES. Giorgio composed 14 pieces as well. Together we composed the remaining 4. By chance calculation we decided, which of the pieces each of us had to compose. The performance was premiered in September the 5th in Piazza dell’Anfiteatro in Lucca. While working at this project, I felt that this series of 14 pieces might transform into an autonomous piece to be performed in a theatre. A year later, I was offered the chance to do this in Berlin: the ensemble Zwischentöne, lead by Peter Ablinger, asked me to compose a piece for them. I decided to re-arrange the I CHING miniatures; the new version included voices, 2 flutes, saxophone, marimba, vibraphone, piano, bandoneon and tapes and was premiered in Ballhaus Naunynstrasse, one of the most important alternative concert-halls in Berlin. The ironic character of the performance was emphasized by minimalistic scenic action mostly based on the inter-play of light and darkness; some lenghts changed; the result was a sort of surrealistic post-industrial cabaret on the border between everyday life and archetypes, mythology and communication. A successive version – made up of 16 miniatures – was arranged for my group IL TEATRO DEL FARO for ‘The Listening Room’ (ABC Radio) in 2000. A peculiar element of this new version was the radiophonic character, which was created by the insertion of landscape sounds and a new definition of the acoustic action; some miniatures were transformed into real acoustic mini radio-dramas. The polyphonic character of the previous version was respected, although some miniatures were arranged for different instruments (flute, bassoon, synth, other kinds of voices, etc.). This version was first broadcast on July the 16th 2001. From then on, the idea of composing all the remaining characters of the I CHING started growing in my mind. I decided to also work on the characters, which Giorgio Lazzarini had worked on four years before and on those we had done together. A first block of 32 pieces (the 1st book of I CHING) was completed in October 2001. I CHING is not only a oracle. Its wisdom comprises all branches of learning. 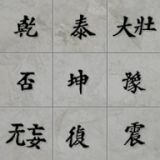 The acoustic dramaturgy I have built on the I CHING characters is mostly based on a sudden interpretation of the images suggested by the titles, basically changing their literary images into sound paintings. In other cases I have tried to go deeper into the meaning of the characters. My aim is to obtain a sort of monument of mankind through the representation of 64 brief acoustic pictures. Like 64 different dreams which reveal themselves as pure images and at the same time hide deeper meanings referring to human archetypes. My idea is that these sound images must be familiar to everybody (as the I CHING images are); but as it happens in dreams, the elements are sometimes mixed or confused, cruelly clear or mysteriously combined. Irony, drama, nonsense, game, death, fiction, disturbance, charm, language all these stylistic elements take part in the acoustic carousel of IL TEMPO CAMBIA just as they do in our path. In the year 2003, the entire version of IL TEMPO CAMBIA (including the second Book of Changes) has been completed (64 pieces). This second part has been produced by SWR2 (Baden-Baden). In the year 2004 the web version of IL TEMPO CAMBIA, created by SWR2 has got the nomination in the Grimme Online Award. 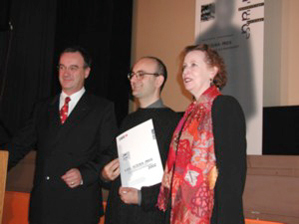 Still in the year 2004, the second part of IL TEMPO CAMBIA has got the special mention of the jury in the Prix Italia.